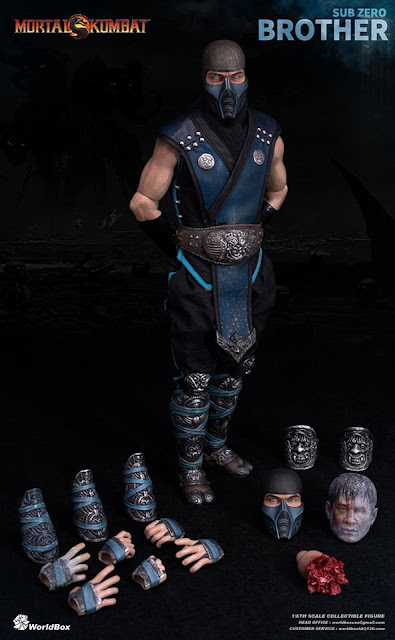 World Box started off the 1/6 Mortal Kombat 9 line with the Sub-Zero figure a while back.. 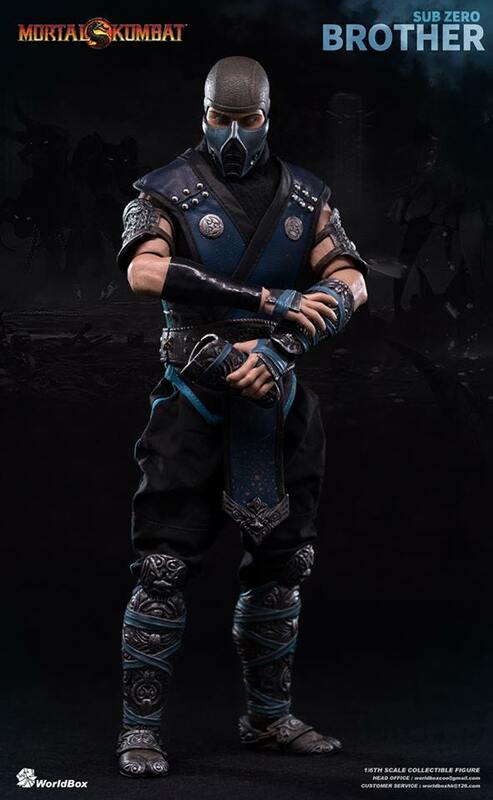 However, just 3 figures into the line, they have now revealed a variant figure for the previously released one. named Sub-Zero (Brother). 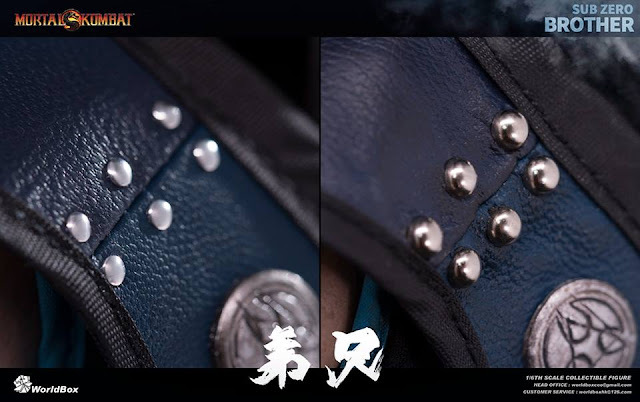 Not very obvious, to be honest, but there are subtle differences in the new figure (on the right). 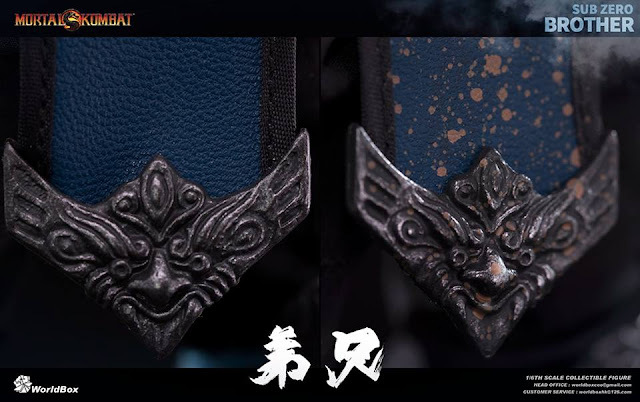 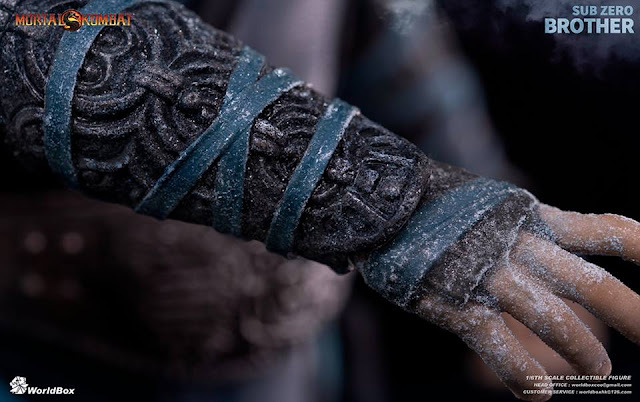 Take a look at the close-up pics..
You can see the mud splatter on some of his clothes and a ice effect on certain parts. 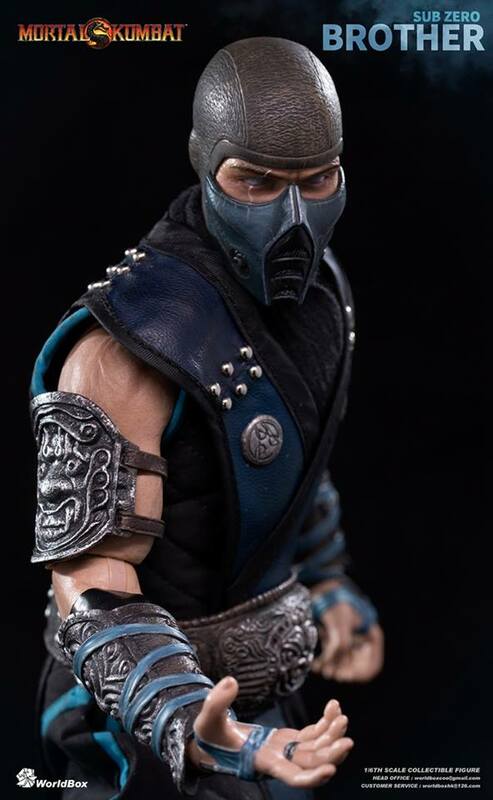 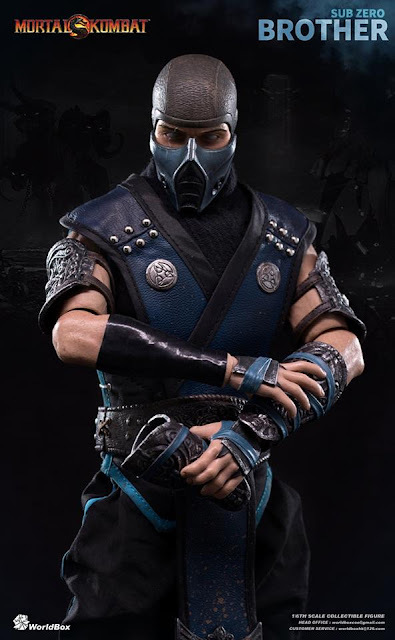 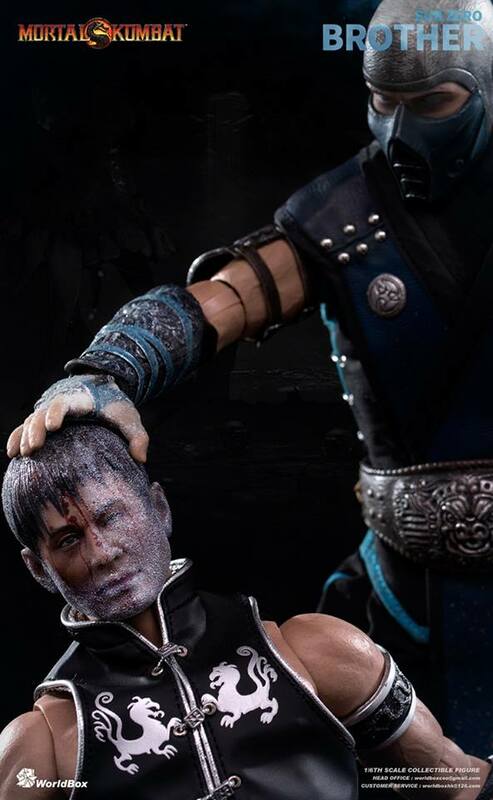 The eye scar evident on this figure confirms it to be Kuai Liang, the younger Sub-Zero. 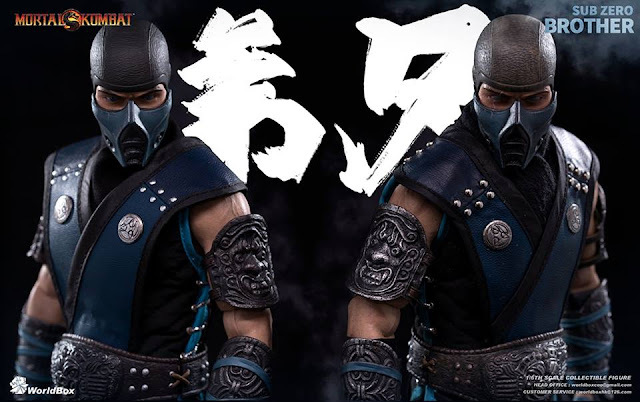 Which is actually very cool (Pardon the pun!). 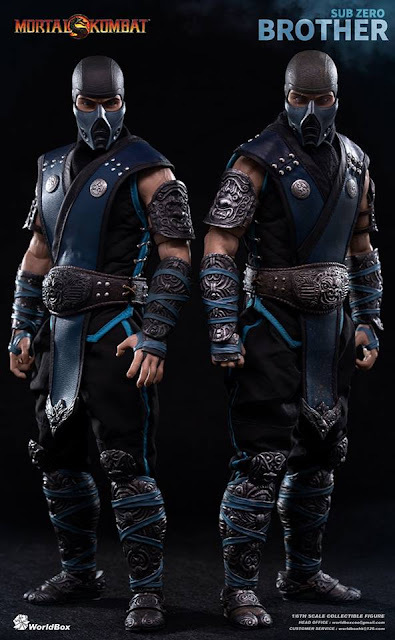 Not many figure companies have actually made 2 Sub-Zero figures that represent the brothers. That's 1 reason for having to own both! 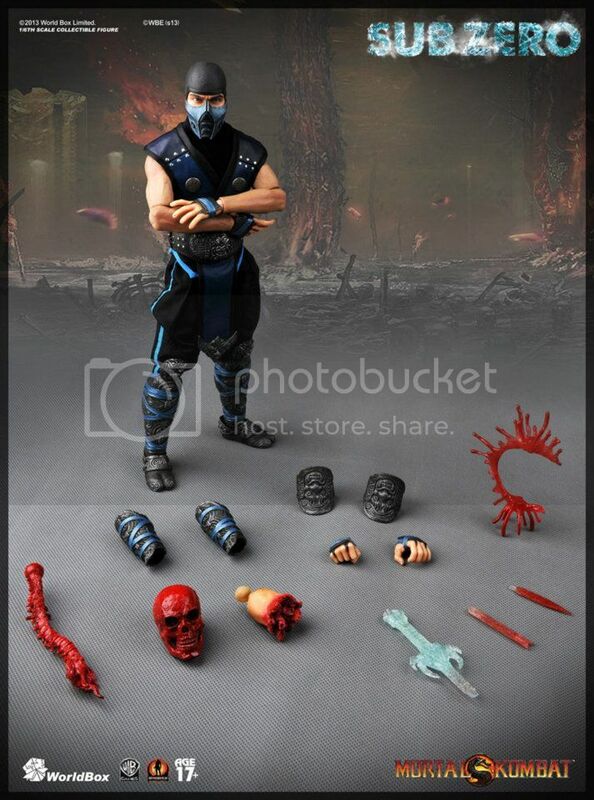 However, that alone isn't going to convince collectors to get a 2nd Sub-Zero figure so here's some more cool stuff! 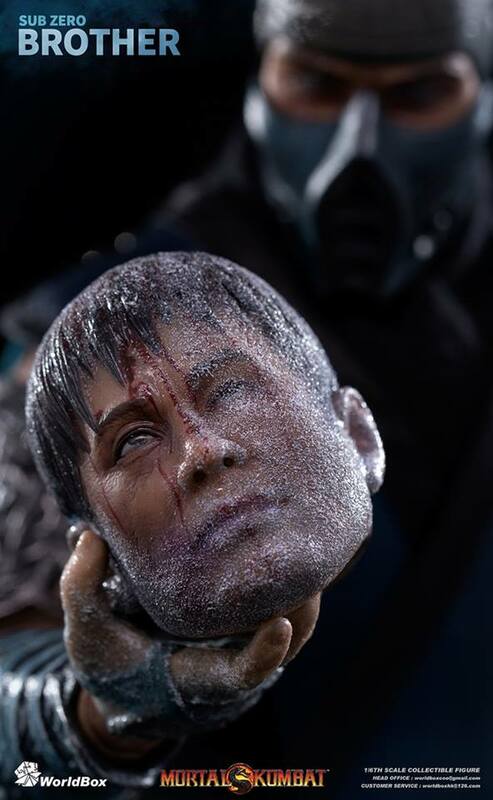 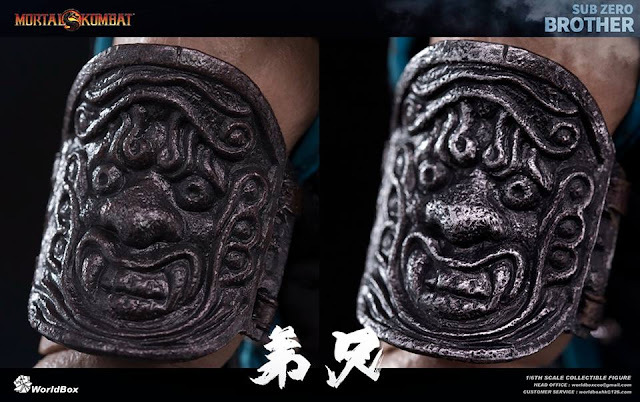 A frozen Kung Lao head! 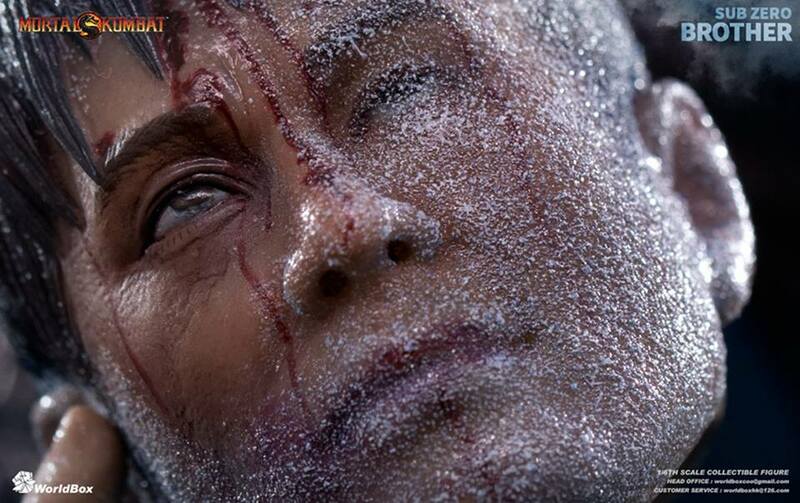 That is just sick! 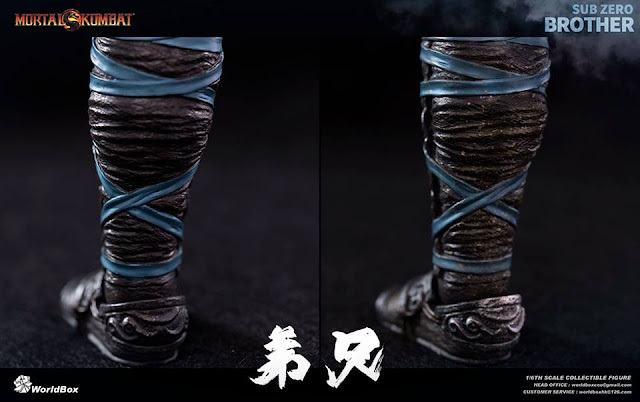 One of the main features of the World Box's 1/6 figure line is the inclusion of Fatality accesories, which are incredible! 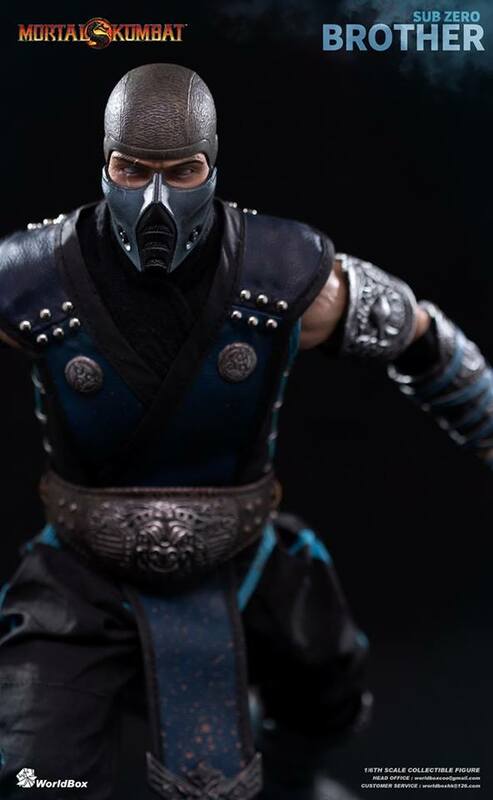 Another reason to own this Sub-Zero figure even if you have the original. 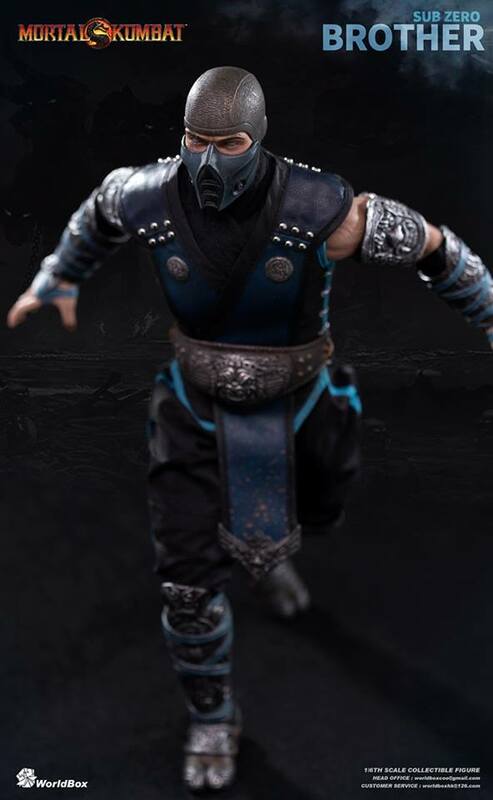 If you missed the first one and can only choose either, this should definitely be the better option, showing off Sub-Zero's ice powers. Here's a reference of the original Sub-Zero's accessories. Come to think of it.. not 100% better. How could you miss out the Spine Rip fatality??!! I was a little skeptical about the "variant" figure but looks like they have convinced me, regarding the Brother that I should get both. For upcoming figures, I would prefer to see new characters rather than "variants" but I would love to see 'accessory packs' where they give us more accessories to use with our current figures. 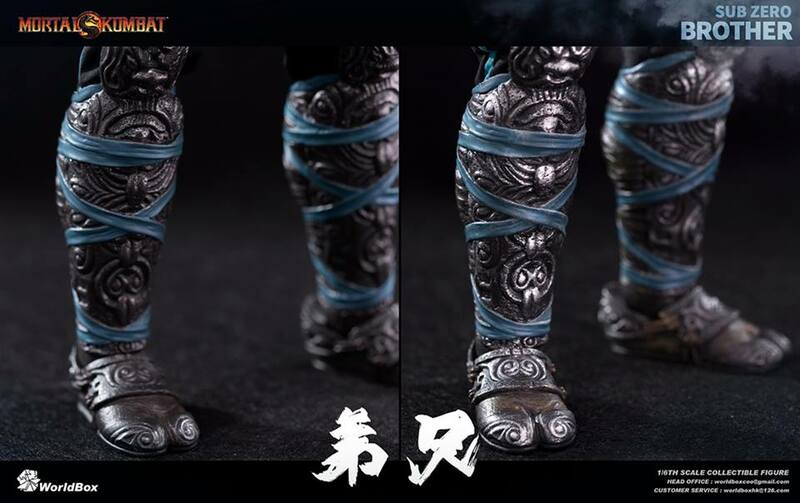 It's taking a long while for World Box to churn out these figures but I'm hoping that we aren't reaching the end anytime soon.